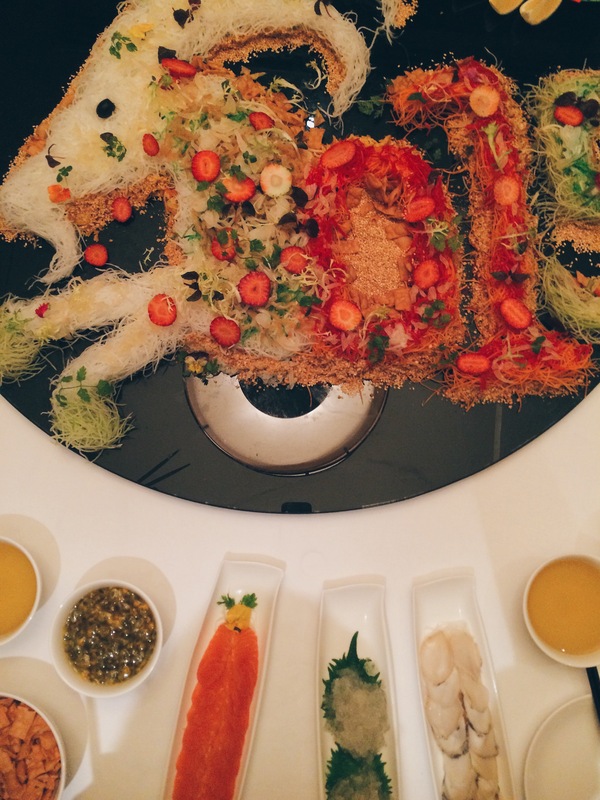 An Extravagant New Year with Xin Cuisine – Here’s Why! Another year and another worry – to fuss over what to eat for reunion dinners this Chinese New Year. Xin Cuisine Chinese Restaurant serves up extravagant, appeasing and delicious Chinese New Year menu that even the pickiest of mother/father-in-laws will be pleased. Xin Cuisine Chinese Restaurant presents some Chinese New Year Dim Sum Combination with a fanciful twist. We kickstart our dinner with the Pan-fried Yam and Pumpkin Cake, topped with X.O. Sauce. 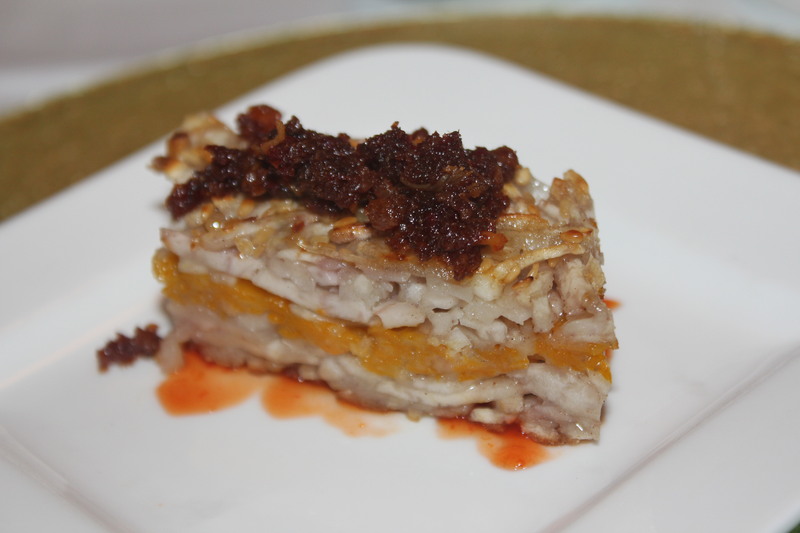 Some unique selling point of the yam cake comes under scrutiny – shredded yam and mashed pumpkin that guarantees that it is freshly-prepared and made. The sesame seed and minced shrimps from the X.O. sauce adds fragrance to the dish. This dish is also available for the take-away menu. 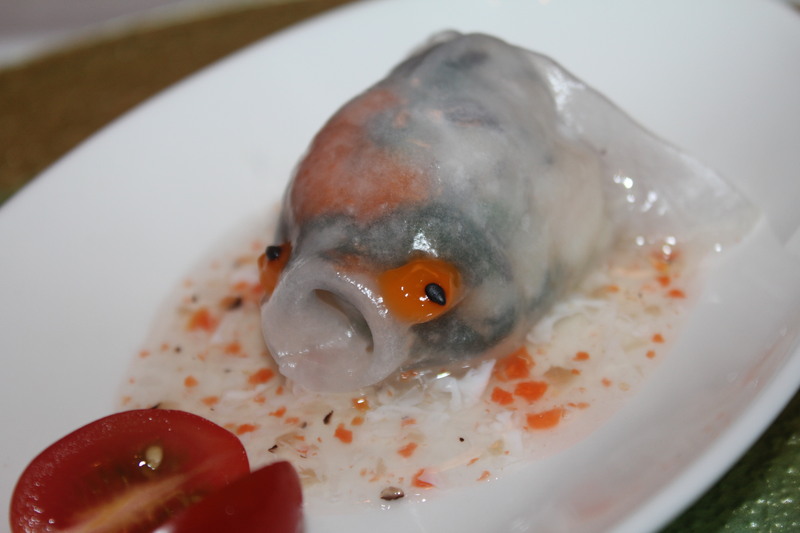 The next Dim Sum is this visually appealing Steamed Prawn Dumpling with Truffle in Egg White Sauce, that is designed to look like a goldfish, a auspicious symbolism in the Chinese culture. The dumpling skin may be a little thick to some, but the dumpling is moist from the egg white sauce accompanied with it. The minced mushroom and prawn in the dumpling brings a nice, light crunch texture. The generous serving of Xin’s Traditional Pen Cai is an extravagant affair – expect scallops, roasted duck, prawns, sea cucumber and fish bladder in a thick and sweet braised sauce. 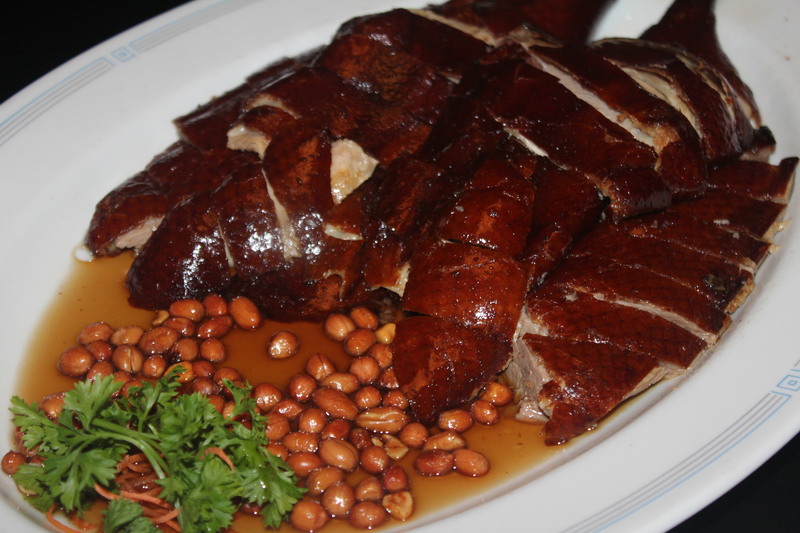 Indisputably the best (and our) favourite dish of the menu is the “Home Style” Roast Duck with Tea Leaves. Infused with the flavors of Jasmine, Pu’er and Chrysanthemum tea, the duck is refreshing with a smoky hint. 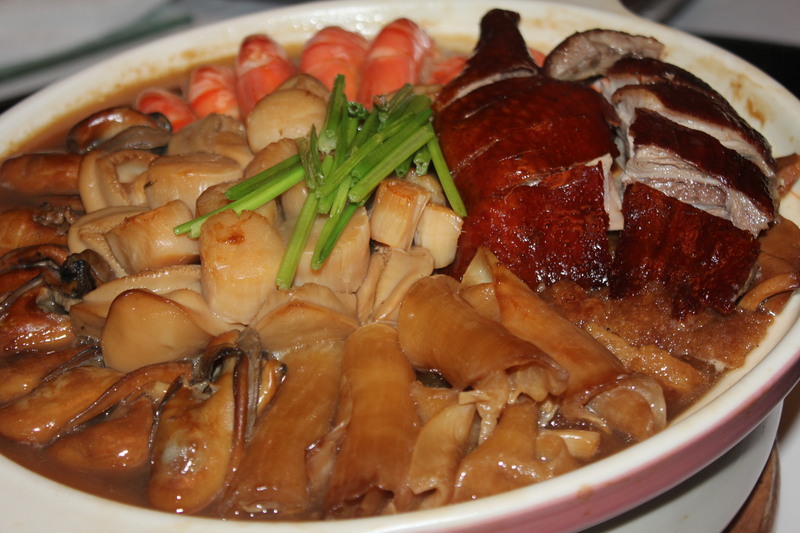 The duck skin is crispy, in contrast with the tender duck underneath. The peanuts on the side is crunchy and paired well with the sauce. You can also have the plum sauce that is available for dipping if you fancy a little zest. 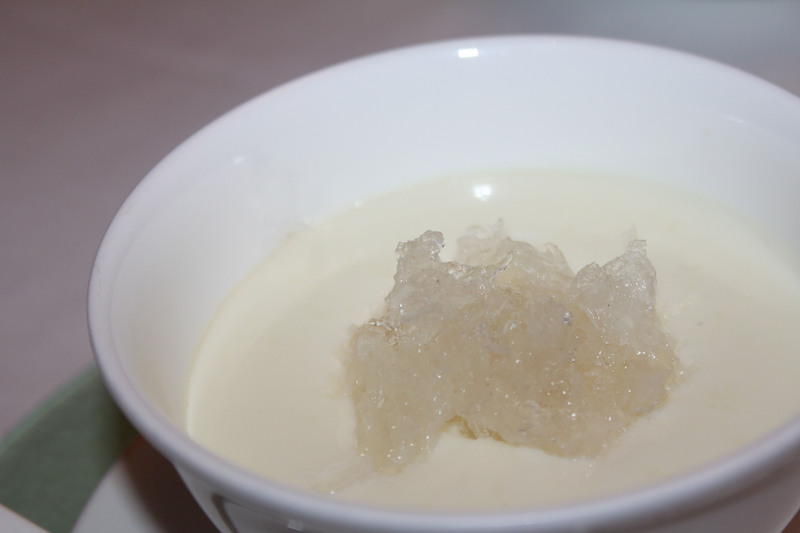 How does a Double-boiled Milk Pudding with Bird’s Nest for dessert sound? The milk pudding is smooth, creamy and topped with generous bird’s nest, all of which supposedly good for your complexion. The milk pudding hasa strong ginger taste that is more palpable for ginger-lovers. Of course, what is Chinese New Year without the Lou Hei? 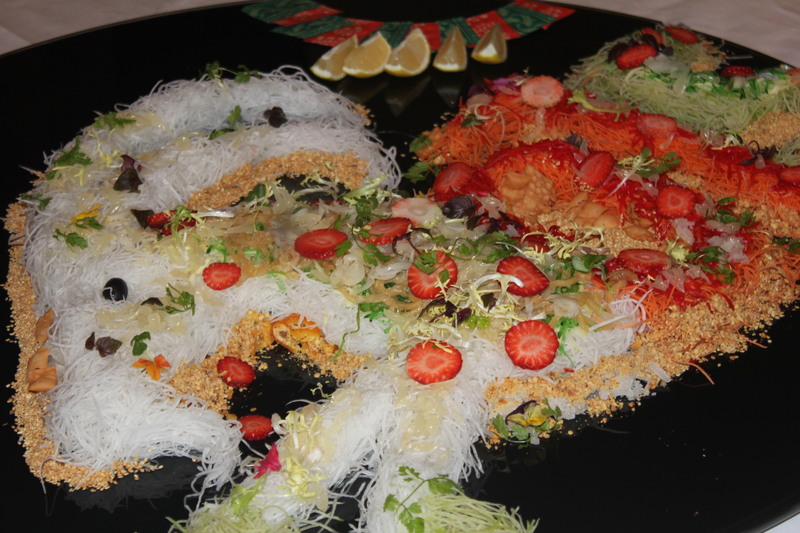 Another extravagant (and fruity) affair – Bird’s Nest, Abalone, Yu Sheng (raw salmon) over the slices of Strawberries with Passionfruit responsible for the overall sweetness. It is creatively designed for the Year of the Goat for 2015. Xin Cuisine Chinese Restaurant presents an extravagant Chinese New Year experience for all. With some refreshing teas (our favourite being Osmanthus Lychee Tea) on the menu, it is going to be a traditional and grand Chinese New Year for diners.